Teaching courses related to the laws of matter and energy is the role of a Physics Teacher. The job description of a Physics Teacher entails performing both teaching and researching tasks. 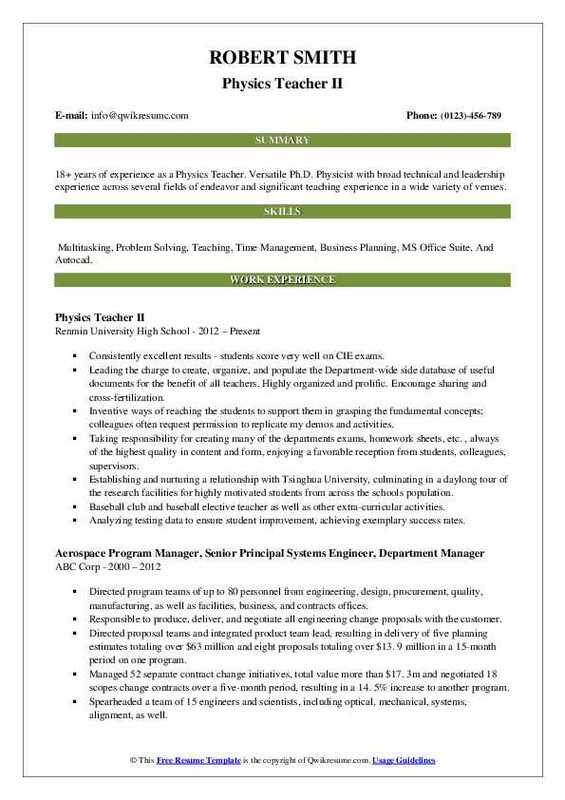 The job duties mentioned on the Physics Teacher Resume include – evaluating and grading students class assignment, homework, and tests; preparing and delivering lecturers, maintaining student attendance records, supervising laboratory work, preparing course materials, supervising UG and graduate teaching and internship; planning and revising course materials and instruction methods. As Physics is a very challenging subject to learn, the burden on the Physics Teacher will be more, and hence these Teachers are expected to have an outstanding skill in explaining complex topics in a simple and understandable manner, they should have a keen understanding of scientific Principles and also be able use appropriate instructional methods and procedures for teaching. A qualified Master’s degree holder in Physics or related to Physical Science becomes a good Teacher. Summary : 17 years of experience as a Physics Teacher is seeking for a challenging position in research science allowing knowledge development while utilizing current skills. Skills : Microsoft Office, Google Docs, Intermediate Level Spanish, Java, Matlab, And Strong Organizational Skills. Applied science standards and experience in scientific research to support student projects. Gathered team members, establishing roles based on strengths. Evaluated "in-class" current curricular scopes and sequences for necessary changes. Developed updated scopes for knowledge depth and breadth. Examined previous curricular documentation as baselines for the newly created documentation. Incorporated the updated scopes and sequences in determining the projects (projects) goals. Performed a wide range of course design, lesson planning, instruction, and classroom management duties. 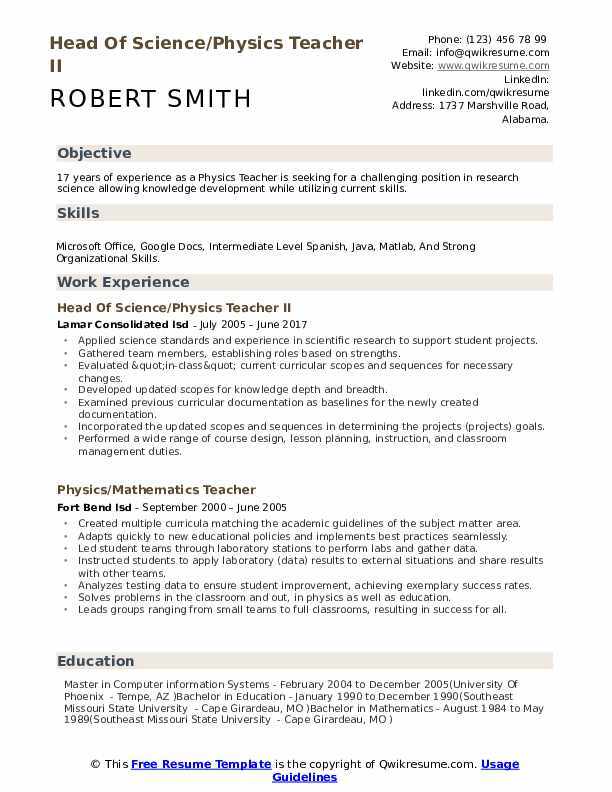 Objective : 4+ years of experience as a Physics Teacher. 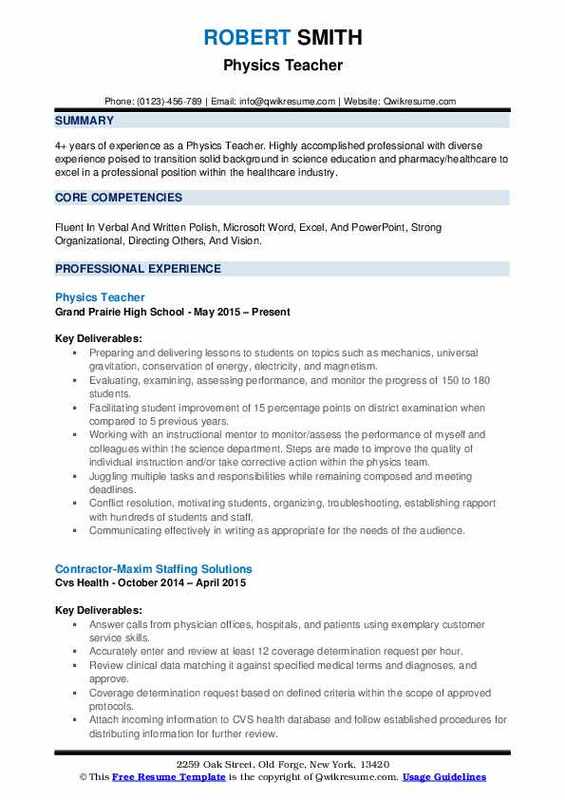 Highly accomplished professional with diverse experience poised to transition solid background in science education and pharmacy/healthcare to excel in a professional position within the healthcare industry. Skills : Fluent In Verbal And Written Polish, Microsoft Word, Excel, And PowerPoint, Strong Organizational, Directing Others, And Vision. Preparing and delivering lessons to students on topics such as mechanics, universal gravitation, conservation of energy, electricity, and magnetism. Evaluating, examining, assessing performance, and monitor the progress of 150 to 180 students. Facilitating student improvement of 15 percentage points on district examination when compared to 5 previous years. Working with an instructional mentor to monitor/assess the performance of myself and colleagues within the science department. Steps are made to improve the quality of individual instruction and/or take corrective action within the physics team. Juggling multiple tasks and responsibilities while remaining composed and meeting deadlines. Conflict resolution, motivating students, organizing, troubleshooting, establishing rapport with hundreds of students and staff. Preparing students for further education by encouraging them to explore learning opportunities and to persevere with challenging tasks. Summary : 18+ years of experience as a Physics Teacher. Versatile Ph.D. Physicist with broad technical and leadership experience across several fields of endeavor and significant teaching experience in a wide variety of venues. Skills : Multitasking, Problem Solving, Teaching, Time Management, Business Planning, MS Office Suite, And Autocad. Consistently excellent results - students score very well on CIE exams. Leading the charge to create, organize, and populate the Department-wide side database of useful documents for the benefit of all teachers. Highly organized and prolific. Encourage sharing and cross-fertilization. Inventive ways of reaching the students to support them in grasping the fundamental concepts; colleagues often request permission to replicate my demos and activities. Taking responsibility for creating many of the departments' exams, homework sheets, etc. , always of the highest quality in content and form, enjoying a favorable reception from students, colleagues, supervisors. Establishing and nurturing a relationship with Tsinghua University, culminating in a daylong tour of the research facilities for highly motivated students from across the schools' population. Baseball club and baseball elective teacher as well as other extra-curricular activities. Analyzing testing data to ensure student improvement, achieving exemplary success rates. 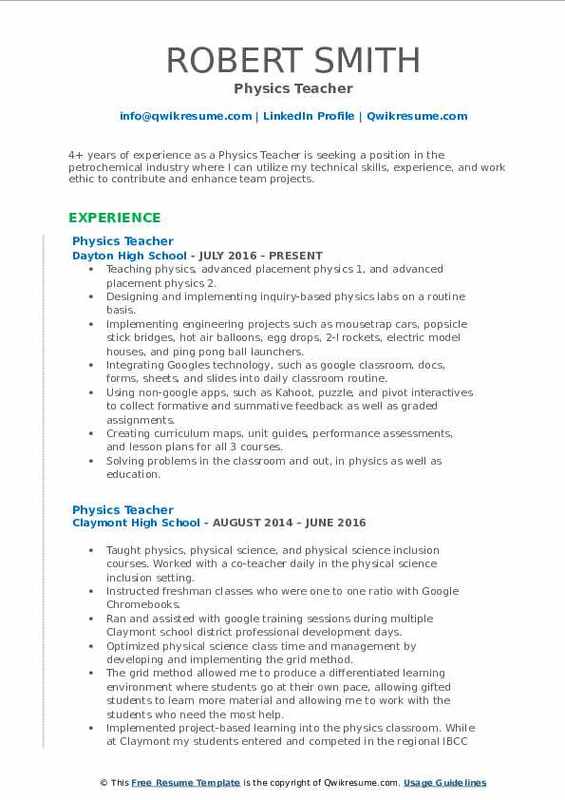 Objective : 4+ years of experience as a Physics Teacher is seeking a position in the petrochemical industry where I can utilize my technical skills, experience, and work ethic to contribute and enhance team projects. Skills : Strong Written And Oral Communication, Interpersonal, Ability To Work Both Independently And With A-Team, Problem Solving, Quick Learner, Ability To Work Under Pressure, Deadline-Driven Environment, Task And Time Management, Coordination, Delegation, Multitasking, Analyzing And Interpreting Data, Teaching Certification Ohio Adolescence To Young Adult (7-12), Endorsement In In Physics/Physical Science Texas Science Grades (4-8), And Science Grades (7-12). Teaching physics, advanced placement physics 1, and advanced placement physics 2. Designing and implementing inquiry-based physics labs on a routine basis. Implementing engineering projects such as mousetrap cars, popsicle stick bridges, hot air balloons, egg drops, 2-l rockets, electric model houses, and ping pong ball launchers. Integrating Google's technology, such as google classroom, docs, forms, sheets, and slides into daily classroom routine. Using non-google apps, such as Kahoot, puzzle, and pivot interactives to collect formative and summative feedback as well as graded assignments. Creating curriculum maps, unit guides, performance assessments, and lesson plans for all 3 courses. Solving problems in the classroom and out, in physics as well as education. Objective : 5 years of experience as a Physics Teacher. Seeking a dynamic management or training coordinator role within a creative and collaborative team dedicated to social enterprise in the San Francisco area. Skills : Curriculum Development, Scientific And Administrative Writing And Editing, Research And Data Analysis, Event Planning And Implementation, Linux And Python Scripting, Training And Educational Instruction. Developed and delivered weekly presentations for nine classes of 25-32 students. Facilitated hands-on learning through creating and supervising laboratory activities and discussions. Designed regular learning assessments and used performance analysis to improve training outcomes. Managed course grade book and schedule of activities to direct students learning progress. Coached senior students on interviewing and self-presentation skills for college admissions. Train students at the governors' academy for engineering studies, in physics and engineering design. Leads groups ranging from small teams to full classrooms, resulting in success for all. Headline : 7+ years of experience as a Physics Teacher. 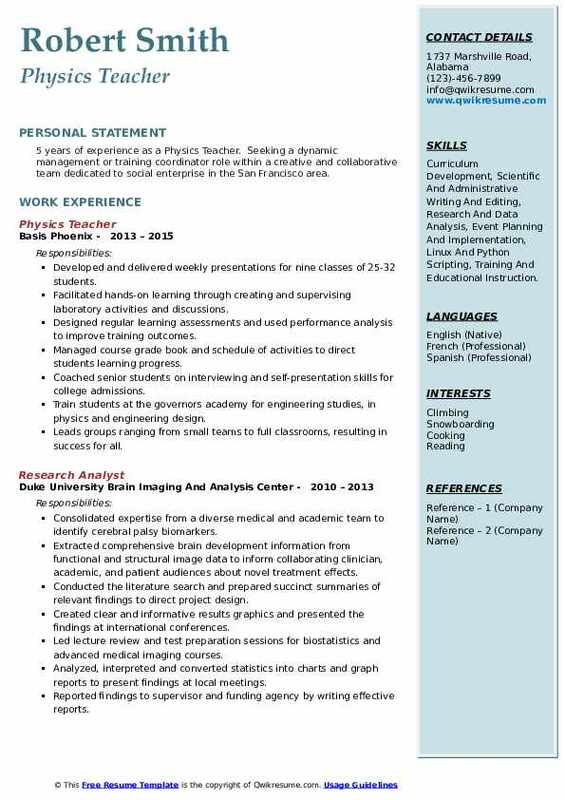 Eager to bring my design configuration and analytical skills to your company using a unique combination of education experience coupled with a year of strong academic background in computer systems and engineering management. Skills : Data Aquisition And Analysis, Physical/Material Science Research, Scientific Writing, Understanding Of Engineering Schematics, Electronic Circuit Design, Excellent Note Taking, Working In Groups, And Programming. Utilizing knowledge to assist students in designing and creating working prototype models of renewable energy systems. Instilling independence in students and a level of research in students. Incorporating the use of electronic media and practical laboratory measures in lesson planning to meet the learning level of all students. Creating an avenue of mutual respect and love among students and those in authority. Routinely evaluating as an exceptional teacher by parents, students, and director. Creating excitement as well as understanding for home-schooled students studying physics in a classroom setting, preparing them for further coursework. Applying a wide range of educational methods to ensure all students are skilled at physics concepts and problem-solving. 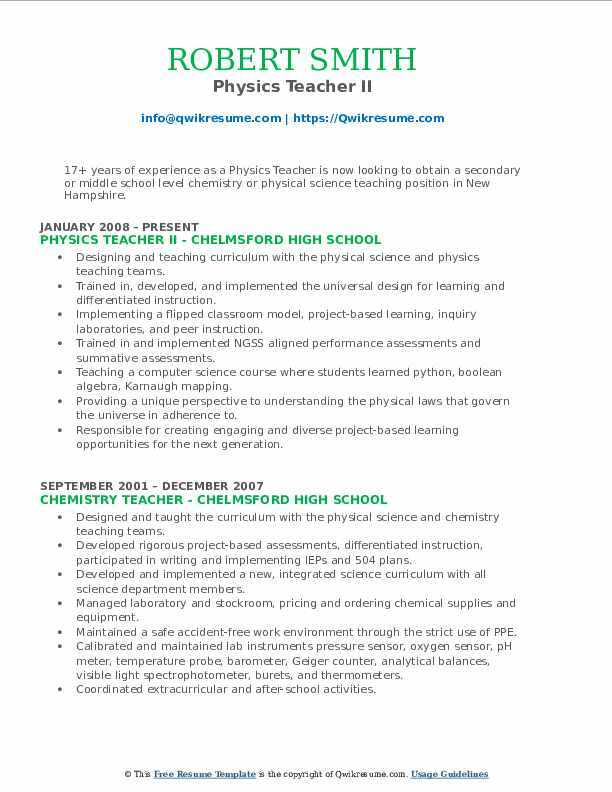 Summary : 17+ years of experience as a Physics Teacher is now looking to obtain a secondary or middle school level chemistry or physical science teaching position in New Hampshire. Skills : Chemistry, Data Analysis, IOS, Marketing Analysis, Online Learning, Business Planning, Interpersonal Skills, Team Player, And Detail Oriented. Designing and teaching curriculum with the physical science and physics teaching teams. Trained in, developed, and implemented the universal design for learning and differentiated instruction. Implementing a flipped classroom model, project-based learning, inquiry laboratories, and peer instruction. Trained in and implemented NGSS aligned performance assessments and summative assessments. Teaching a computer science course where students learned python, boolean algebra, Karnaugh mapping. Providing a unique perspective to understanding the physical laws that govern the universe in adherence to. Responsible for creating engaging and diverse project-based learning opportunities for the next generation. Summary : 15+ years of experience as a Physics Teacher. Possesses extensive scientific knowledge (physics, engineering, health sciences) and its application to laboratory and real-world situations Utilize strong critical thinking and technical skills on a daily basis Demonstrate a variety of communication and teaching methods (in-class, online, and blended instruction). 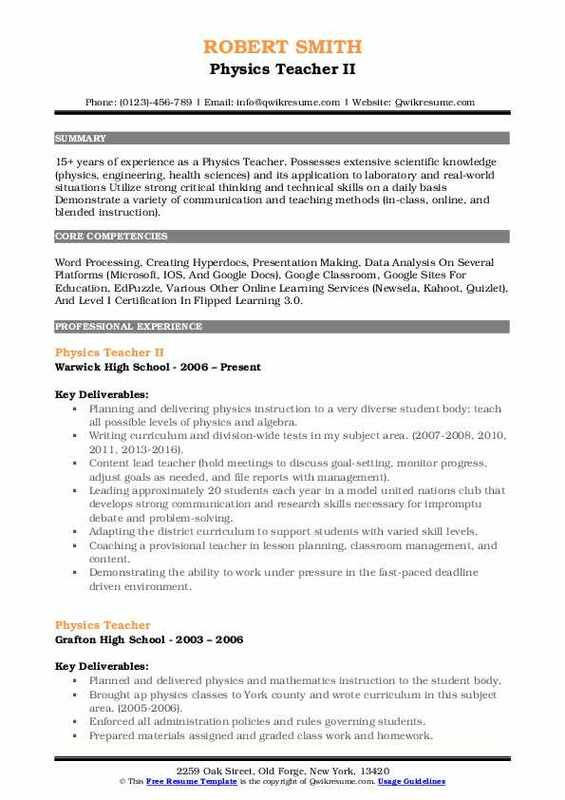 Skills : Word Processing, Creating Hyperdocs, Presentation Making, Data Analysis On Several Platforms (Microsoft, IOS, And Google Docs), Google Classroom, Google Sites For Education, EdPuzzle, Various Other Online Learning Services (Newsela, Kahoot, Quizlet), And Level I Certification In Flipped Learning 3.0. Planning and delivering physics instruction to a very diverse student body; teach all possible levels of physics and algebra. Writing curriculum and division-wide tests in my subject area. (2007-2008, 2010, 2011, 2013-2016). Content lead teacher (hold meetings to discuss goal-setting, monitor progress, adjust goals as needed, and file reports with management). Leading approximately 20 students each year in a model united nations club that develops strong communication and research skills necessary for impromptu debate and problem-solving. Adapting the district curriculum to support students with varied skill levels. Coaching a provisional teacher in lesson planning, classroom management, and content. Demonstrating the ability to work under pressure in the fast-paced deadline driven environment. 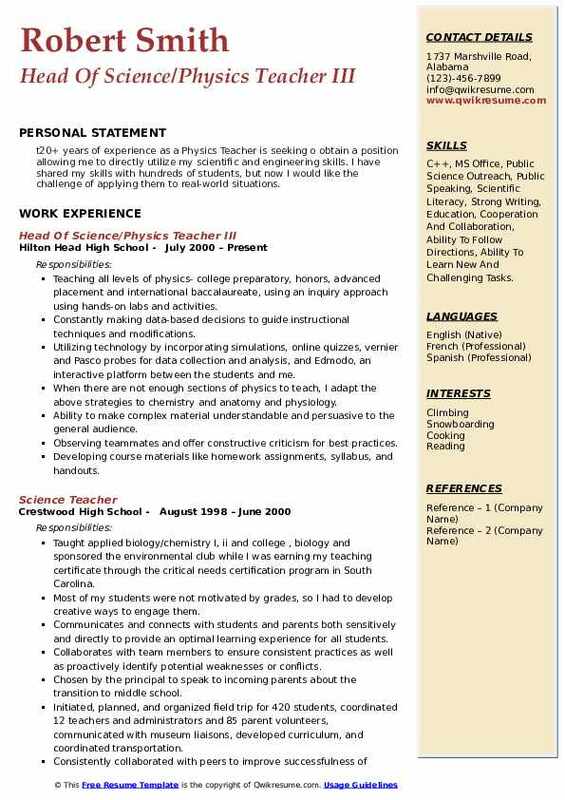 Summary : t20+ years of experience as a Physics Teacher is seeking o obtain a position allowing me to directly utilize my scientific and engineering skills. I have shared my skills with hundreds of students, but now I would like the challenge of applying them to real-world situations. Skills : C++, MS Office, Public Science Outreach, Public Speaking, Scientific Literacy, Strong Writing, Education, Cooperation And Collaboration, Ability To Follow Directions, Ability To Learn New And Challenging Tasks. Teaching all levels of physics- college preparatory, honors, advanced placement and international baccalaureate, using an inquiry approach using hands-on labs and activities. Constantly making data-based decisions to guide instructional techniques and modifications. Utilizing technology by incorporating simulations, online quizzes, vernier and Pasco probes for data collection and analysis, and Edmodo, an interactive platform between the students and me. When there are not enough sections of physics to teach, I adapt the above strategies to chemistry and anatomy and physiology. Ability to make complex material understandable and persuasive to the general audience. Observing teammates and offer constructive criticism for best practices. Developing course materials like homework assignments, syllabus, and handouts. 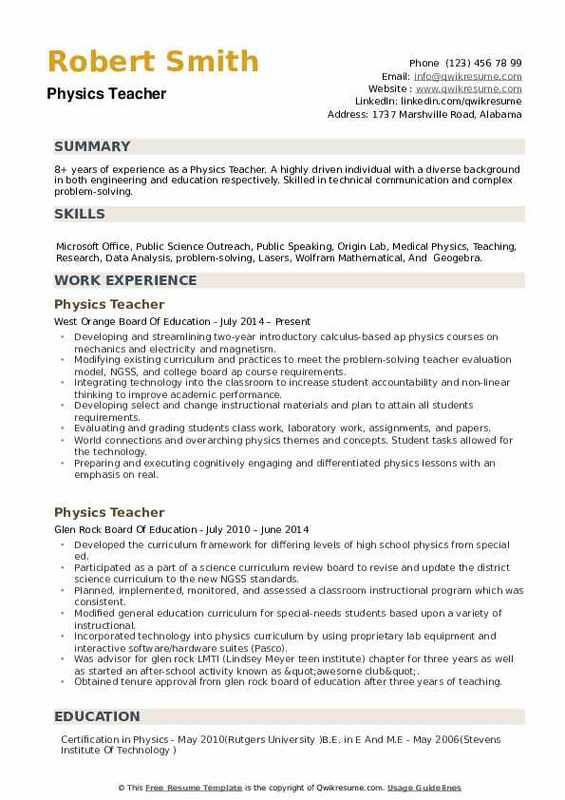 Summary : 8+ years of experience as a Physics Teacher. A highly driven individual with a diverse background in both engineering and education respectively. Skilled in technical communication and complex problem-solving. 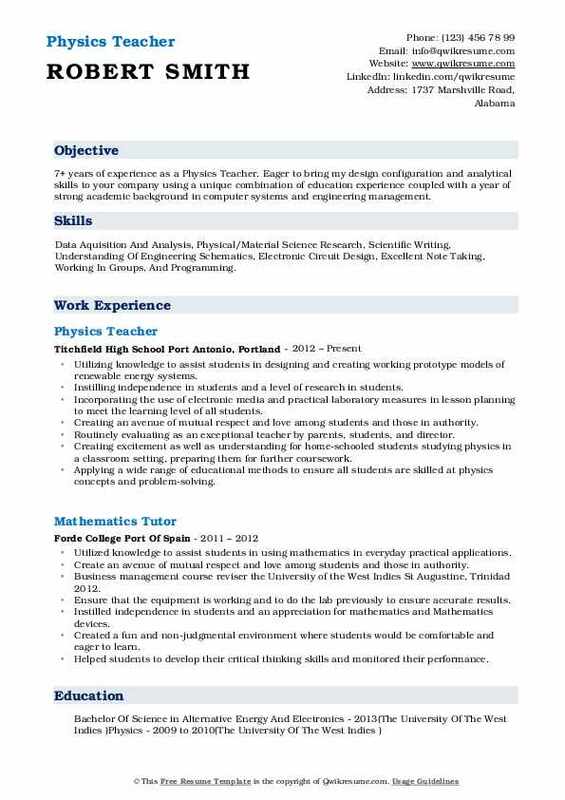 Skills : Microsoft Office, Public Science Outreach, Public Speaking, Origin Lab, Medical Physics, Teaching, Research, Data Analysis, problem-solving, Lasers, Wolfram Mathematical, And Geogebra. Developing and streamlining two-year introductory calculus-based ap physics courses on mechanics and electricity and magnetism. Modifying existing curriculum and practices to meet the problem-solving teacher evaluation model, NGSS, and college board ap course requirements. Integrating technology into the classroom to increase student accountability and non-linear thinking to improve academic performance. Developing select and change instructional materials and plan to attain all students requirements. Evaluating and grading students class work, laboratory work, assignments, and papers. World connections and overarching physics themes and concepts. Student tasks allowed for the technology. Preparing and executing cognitively engaging and differentiated physics lessons with an emphasis on real.